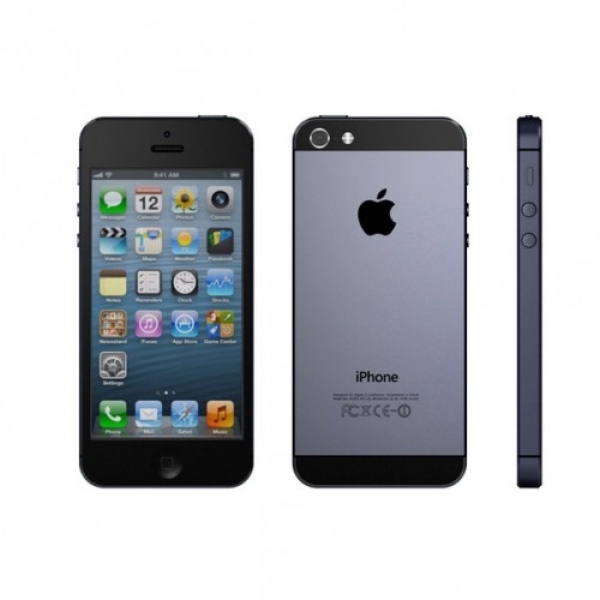 Sleek, attractive, and compact, the Apple iPhone 5 with Wi-Fi and Bluetooth technology gives you everything you want and need from a smartphone. Weighing 3.95 ounces, the Apple iPhone 5 is just 4.87 by 2.31 by 0.30 inches. Its silver aluminum frame is thinner and lighter than ever before. The touchscreen, a backlit LCD, is 4 inches wide diagonally, which was the largest at the time for an iPhone. This smartphone is 18% thinner and 20% lighter than its predecessor, the iPhone 4s. You are sure to love the display, which has a resolution of 640 by 1136 pixels. It creates a crisp image so you can clearly see text, colors, and video. The aspect ratio is 16:9, and the pixel density is the same as the 4s, which is 326 pixels per square inch. Since the screen is protected by Corning Gorilla Glass, it can withstand most short-range drops. Its oleophobic coating makes it resistant to greasy, grimy fingerprints. Using a system-on-chip called the Apple A6, this phone has a dual-core processor and 1GB of RAM. This amount of RAM is double its predecessor. With 32GB of storage, this Apple product can hold a vast collection of content, including photos, videos, music, and apps. You can also enjoy the efficient Siri voice assistant, which was introduced with the iPhone 4s. It gives you quick and easy access to all your apps and information in your phone. Further, Siri can take dictation, which makes texting and writing emails faster and more efficient. In addition, the phone features four sensors, including an accelerometer, gyro sensor, proximity sensor, and compass. You can also pair this iPhone with the Apple Watch. This device was the first to allow that pairing. The iPhone 5 is equipped with two cameras. The primary, or back-facing, option is an 8-megapixel camera. Having autofocus and an LED flash, this camera is great for taking pictures and recording video. It has improved low-light performance and captures pictures 40% faster than the iPhone 4s.